Jeff Cohn Cellars is a family affair. 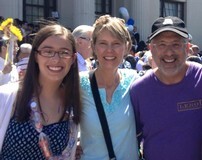 Jeff and Alexandra Cohn live in Alameda with their two daughters Isabel and Haley. 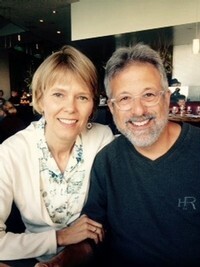 They met in 1987, and married in 1991, recently celebrating their 25th wedding anniversary by accomplishing a goal of 25 dates which they documented throughout the year. They share a passion for running their 5,000 case winery as a team. Jeff crushes the grapes, and Alexandra crunches the numbers. The Jeff Cohn Cellars winery was established in 1996 with just a few labels, expanding to what is now a Rhône-centric and single vineyard Zinfandel-focused Sonoma winery with an average of 20 wines produced each vintage. Growing up in a relatively small town outside the Greenbelt in Bowie, MD, Jeff Cohn is the son of Iris and Elliott Cohn. “My father worked very hard to provide for us and my mother was without a doubt one of the most wonderful people I have ever known. She was kind to a fault, always thinking of others before herself. My goal has always been to make them proud of me.” With support like that, and immense ambition, Jeff was destined for success. Long before his winemaking aspirations, Jeff attended Johnson & Wales University in Rhode Island, earning his associates degree in Culinary Arts. From there he ventured to Florida International University to earn a bachelor’s degree in Hospitality Management. Jeff loved the hospitality industry, and as many do, he found his passion for wine as he worked through several high-profile positions, including the Hyatt Regency Crystal City in Virginia. In a twist of fate, Jeff and Alexandra met while working at the Hyatt. Jeff was the F&B Cost Controller, while Alexandra was an accounting trainee making her way through the departments in the hotel for training. That included working in Jeff’s department for three weeks where she and Jeff got to know each other better. They had both graduated from Florida International University, but their paths never crossed there. It was at their orientation at the hotel where they originally met, and through mutual friends at the hotel, one of which also attended FIU, they were frequently spending their time off together, alone and with their friends playing cards, going on road trips, and enjoying each other’s company. This is where the story of Jeff and Alexandra’s great adventure together begins…. The more Jeff was exposed to wine; the more he strove to learn more to feed his passion. The idea of becoming a winemaker was being nurtured. Starting as an intern at Boordy Vineyards in Maryland, he drove an hour and a half each way to prune in frigid weather, pick grapes in stifling heat, and scrub everything from barrels to floors. The job at Boordy was a defining moment as Jeff was on the road to his dream destination. After graduating, Jeff joined Kent Rosenblum at Rosenblum Cellars as the Enologist. He rapidly moved beyond lab work and soon found himself in charge of the entire white wine program. In 2000, Jeff was promoted to head winemaker, and in 2004 was named vice president of winemaking and production. Jeff was instrumental in creating cutting-edge barrel and yeast programs that took Rosenblum’s wines to a whole new level. It was through experimenting at Rosenblum that Jeff perfected the technique of using different types of yeast to create even more subtle, specific characteristics in the wine he was crafting. At the same time, Jeff was making small production wines under his own label JC Cellars. Jeff was responsible for making the first California Zinfandel to hit the top 10 of the Wine Spectator’s Top 100 list. The 2003 Rosenblum Rockpile Road Zinfandel was rated #3 on the 2005 list. This was not only a coup for Jeff Cohn and Rosenblum; it was an amazing accomplishment for the California wine industry. In 2006, Jeff departed Rosenblum Cellars to focus on his own winery JC Cellars, while consulting for many other wineries along the way, including some of our growers from which we source our grapes. JC Cellars was one of the original urban wineries in the East Bay with the winemaking taking place in the East Bay area, and a tasting room space near downtown Oakland. As the production grew, the wines were distributed in select markets nationwide for restaurant and retail sale. Jeff was making wine while Alexandra jumped on the road to work trade shows, establish distributor relationships, and sell wine to retail stores and restaurants, balancing being a Mom to two beautiful girls, and growing the sales of her winery. The tasting room is now located in the heart of the Historic Sonoma square, with our winery operation just a short 20 miles away in Santa Rosa. This was an exciting time for us to make this move from urban winery to Sonoma Valley winery. We will always love our Easy Bay community, but this move was the next step in the growth of our winery. We source over 85% of our grapes from Sonoma County. It’s a special place with so much diversity in elevations, climate, soils, terroir, and the numerous grape varietals that thrive here. It’s not too cool, not too warm, it’s just right for Jeff’s winemaking style. Our growers have been part of our extended family for many years. It’s a community of like-minded people who don’t so much compete, as they complement each other. We are proud to be home in Sonoma. Jeff’s winemaking style has evolved over the years, but there are three core concepts that Jeff follows year after year. Make the best wine possible from the highest quality fruit, and from the vineyards that showcase the terroir and unique character that sets our wines apart. Jeff and Alexandra's passion for finding rocky, hillside vineyards that produced a sense of minerality set them on the course for what is now Jeff Cohn Cellars. We look for fruit that comes from exceptional vineyards so that we can make exceptional wines. We love vineyards that are rocky and steep, as these types of vineyards produce fruit which leads to concentrated wines bursting with flavor.From alternative fermentation techniques like a concrete egg, larger format French oak barrels, concrete Foudre, terra cotta amphora, to yeast selections that will best suit the character that he wants to coax out of the wine, Jeff takes no shortcuts. Barrel by barrel the wines are nurtured to express the Passion that drives Jeff's thirst for excellence, the Pride of putting the best wine in the bottle, and the Sense of Place that is expressed as a primary characteristic in each and every wine. Harvest is Jeff’s favorite time of the year. You may see him touring around in his purple “Oh Grape” Mini-Cooper from vineyard to vineyard checking grapes. He goes against the grain. The numbers may say it’s time, but it’s Jeff’s palate that says when they are ready. We are fortunate to have growers that respect Jeff’s integrity and trust his winemaking. Those relationships allow us to produce wines, vintage to vintage, that highlight Jeff’s passion. He shares that passion with the winemaking community through moderating winemaker panels, oak symposiums and consulting for other wineries. Giving back to the wine community and the local community is important to the Jeff Cohn Cellars family. Jeff’s mother Iris is an integral part of our story as a winery. A beautiful Iris adorns our label to show that she offered the support that gave Jeff the opportunity to follow his dream. When Jeff and Alexandra decided to start the winery, Iris gave them the financial means to allow Jeff to follow his passion. If not for her, none of this would have been possible. “The Iris on the label is a constant reminder that my mother, Iris, is celebrated and recognized in every wine we make.” It’s a beautiful tribute to a strong, beautiful woman. While Jeff is the artist who creates our “vinous elixirs” as Robert M. Parker, Jr., calls them, Alexandra is the glue that binds our team, and the Jeff Cohn family. “Ask Alexandra,” can be heard every day at the tasting room, office, and winery. She knows the business inside and out. From production to accounting, Alexandra seamlessly changes her hats like a performer changes costumes. She is an accountant by trade, managing all financial aspects of the business, but she’s no bean counter. Her creativity shines through in all that we do. From label designs, marketing, and wine club administration to tasting room design, event coordination, and managing sales, you can see Alexandra’s mark on everything that we do. Her favorite job is being a wife and mother. She loves to cook, bake, and entertain in between carpooling, taking care of two teenage girls, and training a new puppy. She is creative, crafty, and has more energy than the rest of the team put together. Her enthusiasm is contagious, encouraging us all to think outside of the box while not reinventing the wheel. Jeff and Alexandra’s JC Cellars became well known for some unique offerings starting with their Rhodes Vineyard Zinfandel which was ready to harvest on the day that their first daughter Isabel was born and then again on her first birthday. Since then, Isabel’s name adorns a Zinfandel label each vintage. She is easy-going, loves to laugh and her smile lights up the room, but as any teenager making their way through this world, she does have her darker moments. “I liken my Zinfandel to her personality, vibrant and fresh, sunshine in a bottle, but also has a little darkness or depth to make it intriguing and interesting.” Currently Isabel’s name adorns the 2014 Sweetwater Springs Zinfandel. Isabel can be found some days on the road driving around with her Dad to check on the vines as they mature. Currently attending Berkeley City College, she will be going off to Portland in the Fall of 2018 to study Graphic Design and Music. She is a very talented guitar player and has dedicated time and efforts receiving her Girl Scout Gold Award by raising money for instruments and giving guitar lessons to budding musicians at the Boys and Girls Club of Alameda. Jeff and Alexandra’s youngest daughter Haley’s name adorns our flagship Rockpile Vineyard Syrah. Jeff and the Rockpile Vineyard have a long, loving friendship with some rocky moments, sometimes like Haley. “She is a bit hard headed and determined, insistent on doing things her way. Yet, she too has a soft and generous side not unlike the Rockpile Syrah which has many layers and complexities, just like Haley.” She started high school last fall, and is spreading her artistic wings through drawing and water color painting. 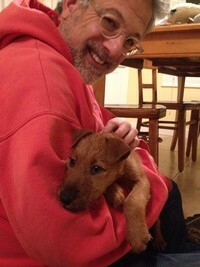 The latest addition to our family is our Irish Terrier puppy Riley. She has big shoes to fill as we said goodbye to our beloved Welsh Terrier Abby last year, but as Riley matures, she will become part of our winery team. During his time at Rosenblum, Jeff was making a few wines each vintage under his own label JC Cellars, beginning in 1996. As his love of the Rhônes continued, he focused on learning from some of the finest winemakers from the Northern Rhône. In 1998 at Hospice du Rhône, Jeff found himself on the bowling team with some of his winemaking idols from Côte-Rôtie, St. Joseph, and Condrieu. They bowled, they drank wine, and they collaborated, and shared their passion. This transformed the resources with which Jeff surrounded himself, creating what we fondly refer to as our French Connection. A person of passion seeks out others of passion. To date, Jeff has made wine with Pierre Gaillard, Francois Villard, Yves Gangloff, and Yves Cuilleron. Our current projects include our third vintage of Stagecoach Viognier “2 Guys 2 Barrels” made with Yves Gangloff. Jeff loves Condrieu that shows a sense of mineral backbone. When Viognier from Stagecoach became available Jeff called his friend Yves and asked if he would like to work together. The result has been an amazing Viognier that showcases the Stagecoach fruit, while imparting French winemaking techniques that take it to another level. Yves’ son Loup even designed the label which is unique and classy, without being too serious. Yves Cuilleron is the connection for our latest project “Domaine des Chirats” Rockpile Vineyard Syrah. The second vintage of this wine, which has just been released, is just magical. Elegant is not a descriptor oft used for wines from Rockpile, but if a wine this bold can be elegant, this one is. The minerality is stunning and showcases the native yeast that Jeff isolated from Rockpile while working for Rosenblum. It adds finesse to our Rockpile Syrahs that is so unique; it’s hard to believe you are drinking a California Syrah. Jeff and Yves find the perfect balance between bold California fruit and French sophistication.